Objective: The 6-minute walk test (6MWT) is an established measure of exercise capacity in adults and children with chronic cardiac or respiratory disease. Despite its widespread use, there are no normal values for healthy children under 12 years of age. We aimed to provide normal values for children between 4 and 11 years. Methods: Healthy children were recruited prospectively from two UK primary schools and also children visiting Great Ormond Street Hospital. 328 children (54% male) aged 4 to 11 years were included in the study. Main outcome measures were the distance walked in 6 minutes, and oxygen saturation and heart rate during the 6 minutes and during a 3-minute recovery period. Results: Mean oxygen saturation at baseline and during the 6MWT was 97–99%. Heart rate increased from 102±19 bpm at baseline to a maximum of 136±12 bpm. Overall, the mean distance walked in 6 minutes was 470±59 m. Distance walked correlated with age (r = 0.64, p<0.0001), weight (r = 0.51, p<0.0001) and height (r = 0.65, p<0.0001) with no significant difference between boys and girls. The distance walked increased significantly year on year from 4 to 7 years (4 years 383±41 m; 5 years 420±39 m, 6 years 463±40 m; 7 years 488±35 m; p<0.05 between each); further modest increases were observed beyond 7 years of age. Conclusions: Performing a 6MWT is feasible and practical in young children. This study provides data on normal children against which the performance of sick children and the response to therapeutic intervention can be judged. The 6MWT is easy to perform and can be repeated at low cost, unlike cardiopulmonary exercise testing with metabolic monitoring, which requires expensive equipment, technical expertise and training of the subject. The 6MWT is increasingly used in young children, for whom performing cardiopulmonary exercise tests is especially problematic, requiring a high degree of cooperation, good coordination and motivation. The 6MWT is frequently used in children with pulmonary hypertension and cystic fibrosis and in those with severe cardiopulmonary diseases being assessed for transplantation.3 8 9 To our knowledge, despite its frequent use, there are no normal values available for children under 12 years of age. We studied 328 normal, healthy children (54% of whom were male) aged between 4 and 11 years. They were recruited from two primary schools plus healthy siblings and relatives of children attending Great Ormond Street Hospital. Parents gave informed consent and any children with chronic disease were excluded. However, children with mild asthma, who were not on regular bronchodilators and not excluded from physical education classes, were accepted as normal. All children willingly agreed to perform the 6MWT. All 6MWTs were conducted using a lap 30–50 m in length on flat, hard ground, according to the ATS guidelines.10 The same instructions were given to all children before undertaking the walk test. The children were asked to walk up and down the measured lap at their best pace but not to run or race. The tests were undertaken by each child separately to prevent competition. The instructor walked behind the child to make sure that the child determined the pace his/herself and also to determine the oxygen saturation and heart rate at the specified times. Encouragement (eg, “Keep going”, “You are doing well”) and announcement of time remaining were given to the children. No comments were made regarding the child’s performance, such as, “You could go faster” or “Slow down”. Weight, height, gender and ethnic background were documented. The ethnic distribution was Caucasian n = 272 (83%), Asian/Asian-Caucasian n = 33 (10%), Afro-Caribbean/Afro-Caribbean-Caucasian n = 23 (7%). The total distance walked in 6 minutes was measured. The oxygen saturation and heart rate were measured before the start of the walk, after every minute during the test and during the recovery period after 1 and 3 minutes. We used a portable pulse oxymeter (PulsoxTM-3iA, Minolta) attached to the child’s wrist and a finger. It was lightweight, weighing 42 g excluding batteries, wrist band and probes. The data were obtained by three different investigators. Split analysis of the distance walked corrected for age did not reveal any significant difference between the values obtained by different investigators, suggesting that there was no inter-observer variation. The data were therefore pooled. The study was approved by the local ethics committee and parental consent was obtained. Values are presented either as mean±SD, SEM or as median, 5th, 25th, 75th and 95th centile as indicated in the respective figures and tables. No significant decrease in transcutaneous oxygen saturation was observed during the test in this healthy cohort. The mean oxygen saturation was 97–98% at baseline, and the minimum saturation was 95–96% during the walk test. The heart rate increased from a baseline of 102±19 bpm reaching a plateau of 136±12 bpm after 1–3 minutes (fig 1). The heart rate during exercise was higher in girls than in boys (fig 1) (p<0.05). Figure 1 Heart rate at baseline, during the 6-minute walk test and on recovery in boys and girls. The heart rate was significantly higher in the girls (mean±SEM; *p<0.05). The mean distance walked increased from 383±41 m at 4 years to 512±41 m at 11 years, with no significant difference between boys and girls (fig 2a, table 1). The data from both sexes were therefore pooled (fig 2b). 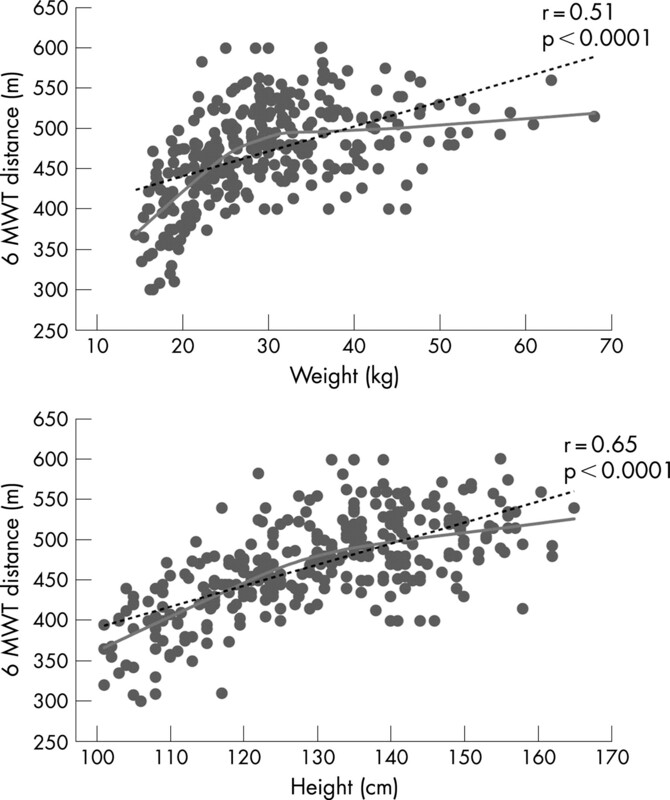 The distance walked correlated with age (r = 0.64, p<0.0001). The mean 6MWT distance increased by 37 m between the age of 4 and 5 years (p<0.001), by 43 m between 5 and 6 years (p<0.001) and by 25 m between 6 and 7 years of age (p = 0.002). Beyond 7 years of age, the distance walked did not increase significantly from one year to the next but there was a significant increase between 7 and 11 years of age (p = 0.02). Figure 2 (A) The distance walked in 6 minutes by boys and girls in each age group. Data are shown as box-and-whiskers plots illustrating the median, 25th and 75th centile (grey box) and 5th and 95th centile. p Values refer to the difference between various age groups, having pooled data from both sexes (unpaired t-test). (B) Walk test difference of different age groups. Data are shown as histograms and box-and-whiskers-plots illustrating the median, 25th and 75th centile (grey box) and 5th and 95th centile. The distance walked correlated with weight (r = 0.51, p<0.0001) and height (r = 0.65, p<0.0001) on univariate linear regression analysis (fig 3), as well as age. On multivariate analysis, 44% of the variation in distance walked by the children could be accounted for jointly by age, weight and height (r = 0.67, p<0.0001), age alone accounting for 41% of the variation (r = 0.64, p<0.0001). The analysis of walk test distance corrected for age did not reveal any significant difference between different ethnic groups. Figure 3 Relationship between distance walked in 6 minutes and height and weight. r and p values were derived for a linear relationship (black, dotted line). The grey curve represents the average value of the distance as a function of weight and height (Lowess technique). The fitted smooth curve shows a form of response that is clearly inconsistent with a linear relationship. It suggests that there is an approximate linear relationship up to a weight of ∼30 kg and a height of ∼130 cm. After these points the curve gradually merges into a more horizontal line and especially a further increase in body weight appears to be widely unrelated to improved 6-minute walk test (6MWT) distance. In contrast to unadjusted 6MWT, we found a linear increase in 6MWT adjusted for each child’s weight (6MWT×weight) and age (r = 0.80, p<0.0001) without evidence of any plateau phenomenon. The current study establishes for the first time normal values for 6WMT distance in children between 4 and 11 years of age. Our study suggests that distance walked increases with age. As no reference values for 6MWT distance have been available in younger children, quantification of exercise intolerance in this population is largely based on data extrapolated from older individuals and is prone to error. From clinical experience it is apparent that a 6MWT can be performed by young children but depends upon child motivation and coordination. With explanation and encouragement we found that children from the age of 4 years performed the 6MWT well. The variation in walk distance in children of 4 and 5 years did not differ significantly from that observed in the older children. Our cross-sectional study suggests that there is a rapid increase in the distance walked in children aged 4 to 7 years of age with a further slower increase up to 11 years of age. To date, normal values for the 6MWT have only been reported in older cohorts. 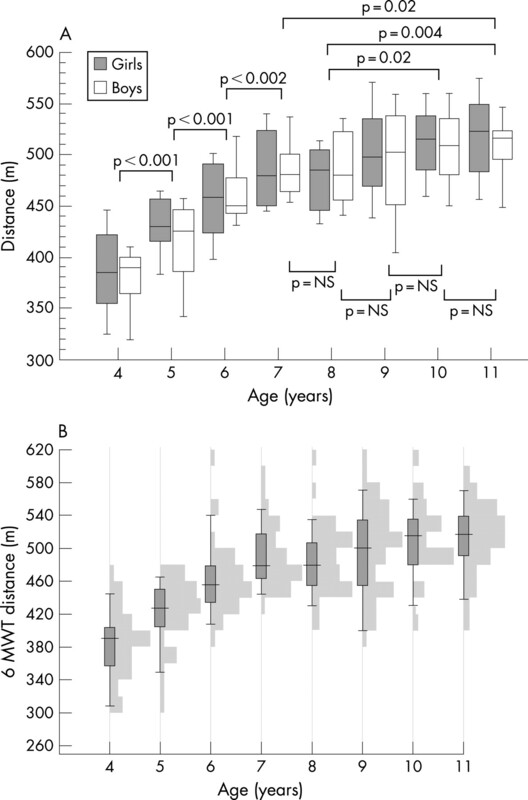 Li and colleagues reported normal values in 78 Chinese children aged between 12 and 16 years of age.16 Mean distance for the whole group was 660±58 m; this distance is considerably longer than in our 11 year old children (512±41 m). Unfortunately values for the individual age groups are not reported, given the age of these children the greater distance might be related to an increase in height during and after puberty. Chetta et al reported in a Caucasian cohort aged 20–50 years a mean distance of 593 m for females and 638 m for males.17 For an older age group (40–80 years), Enright reported a median walk distance of 494 m for women and 576 m for men. After correction for height there was no gender-related difference, as we also found in our study.18 In young adults, age was not a related to 6MWT distance.18–21 By contrast, in our pediatric cohort we found that age alone accounted for 41% of predicted walk-test distance variation. The heart rate recorded in this study demonstrates that the 6MWT represents submaximal effort in healthy children. Estimated peak heart rate during maximal exercise of children between 4 and 11 years of age would be approximately 210 bpm (220 bpm minus age).22 Thus peak heart rate in our study was approximately 65% of the normal predicted peak heart rate for age. In our population, heart rate increased early in the test with a plateau after 1–3 minutes. Heart rate during exercise was higher in girls than in boys. A similar observation was made by Mahon who described a lower heart rate in boys during submaximal exercise during a graded exercise test on a cycle ergometer.23 This phenomenon was also observed by Armstrong, investigating cardiovascular responses to submaximal treadmill running in children between 11 and 13 years. He illustrated, that after adjustment for body size, boys had a greater stroke volume than girls when exercising at the same level.24 The authors suggested that girls compensated for the lower stroke volume with a significantly higher heart rate. Knowledge of normal 6MWT distances for children should be helpful to assess the degree of exercise limitation in children with cardiovascular disease. For example, the 6MWT is commonly used in children with chronic diseases, such as pulmonary hypertension to assess response to advanced therapies.25 26 Our data show that an increase in walk distance needs to be interpreted with caution, as a physiological increase could easily be (mis)interpreted as a response to therapy, whereas in fact it reflects the effect of growth. We performed only one 6MWT per child. It has been shown that there might be a training effect and a longer distance might be reached on a repeated tests.20 27 28 However a high degree of test–retest reliability has recently been reported by Li et al in healthy children.16 It has recently been shown in a study of healthy Singaporean adults that 6MWT distance cannot be predicted using reference equations derived from adult Caucasian populations.29 We enrolled children from different ethnic backgrounds; the majority were of Caucasian origin. In our study there was no significant difference between the distance walked by the Caucasian children and the other groups. Performing a 6MWT is feasible and practical in young children. This study provides data on normal children against which the performance of sick children and the response to therapeutic intervention can be judged. The 6-minute walk test (6MWT) is a simple method for assessing exercise capacity at submaximal level and is used routinely to assess patients with cardiovascular or pulmonary disease. In adults it is an independent predictor of morbidity and mortality in patients with heart failure, chronic respiratory disease, cystic fibrosis and idiopathic pulmonary hypertension. It is also useful for longitudinal assessment to monitor response to treatment and to guide therapy. The 6MWT is easy to perform and can be repeated at low cost, unlike cardiopulmonary exercise testing with metabolic monitoring, which requires expensive equipment, technical expertise and training on the subject. The 6MWT is frequently used in children with pulmonary hypertension and cystic fibrosis and in those with severe cardiopulmonary diseases being assessed for transplantation. Despite its frequent use, there are no normal values available for children under 12 years of age. This study shows that performing a 6-minute walk test is feasible and practical in young children. This study provides data on normal children against which the performance of sick children and the response to therapeutic intervention can be judged. We would like to thank all the pupils, teachers and staff at the schools who helped and supported us in this study, and the siblings and relatives of patients at Great Ormond Street Hospital for their help and participation.
. A qualitative systematic overview of the measurement properties of functional walk tests used in the cardiorespiratory domain. Chest 2001;119:256–70.
. Predictive factors of hospitalization for acute exacerbation in a series of 64 patients with chronic obstructive pulmonary disease. Am J Respir Crit Care Med 1999;159:158–64.
. The six-minute walking test in children with cystic fibrosis: reliability and validity. Pediatr Pulmonol 1996;22:85–9.
. Prediction of mortality and morbidity with a 6-minute walk test in patients with left ventricular dysfunction. SOLVD Investigators. JAMA 1993;270:1702–7.
. Clinical correlates and prognostic significance of six-minute walk test in patients with primary pulmonary hypertension. Comparison with cardiopulmonary exercise testing. Am J Respir Crit Care Med 2000;161:487–92.
. Goal-oriented treatment and combination therapy for pulmonary arterial hypertension. Eur Respir J 2005;26:858–63.
. End points and clinical trial designs in pulmonary arterial hypertension: clinical and regulatory perspectives. J Am Coll Cardiol 2004;43:48S–55S.
. Two minute walking distance in cystic fibrosis. Arch Dis Child 1988;63:1444–8.
. A six-minute walk test for assessing exercise tolerance in severely ill children. J Pediatr 1996;129:362–6. ATS statement: guidelines for the six-minute walk test. Am J Respir Crit Care Med 2002;166:111–7. R Development Core Team. R: A Language and environment for statistical computing, Vienna: R Development Core Team, 2006, http://www.R-project.org.
. CDC growth charts: United States. Advance data from Vital & health statistics of the National Center for Health Statistics. 2000:1–27.
. Does the 6-minute walk test predict the prognosis in patients with NYHA class II or III chronic heart failure? Am. Heart J 1998;136:449–57.
. Aerobic parameters of exercise as a function of body size during growth in children. J Appl Physiol 1984;56:628–34.
. The six-minute walk test in healthy children: reliability and validity. Eur Respir J 2005;25:1057–60.
. Six-minute walking test in cystic fibrosis adults with mild to moderate lung disease: comparison to healthy subjects. Respir Med 2001;95:986–91.
. The six-minute walk test. 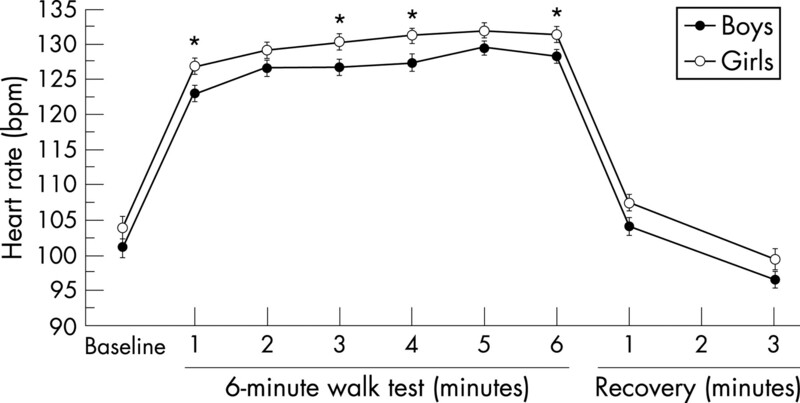 Respir Care 2003;48:783–5.
. Six-minute walk test: a valuable test, when properly standardized. Phys Ther 2002;82:826–7.
. Reference values for a multiple repetition 6-minute walk test in healthy adults older than 20 years. J Cardiopulm Rehabil 2001;21:87–93.
. Reference equations for the six-minute walk in healthy adults. Am J Respir Crit Care Med 1998;158:1384–7.
. Heart rate recovery from submaximal exercise in boys and girls. Med Sci Sports Exerc 2003;35:2093–7.
. Cardiovascular responses to submaximal treadmill running in 11 to 13 year olds. Acta Paediatr 2002;91:125–31.
. Beneficial effect of oral sildenafil therapy on childhood pulmonary arterial hypertension: twelve-month clinical trial of a single-drug, open-label, pilot study. Circulation 2005;111:3274–80.
. Epoprostenol treatment in children with severe pulmonary hypertension. Heart 2007;93:739–43.
. Reproducibility of walking test results in chronic obstructive airways disease. Thorax 1988;43:388–92.
. Reliability and intensity of the six-minute walk test in healthy elderly subjects. Med Sci Sports Exerc 2003;35:169–74.
. Six-minute walk distance in healthy Singaporean adults cannot be predicted using reference equations derived from Caucasian populations. Respirology 2006;11:211–6. Archives of Disease in Childhood 2008; 93 i-i Published Online First: 21 May 2008. Cardiorespiratory fitness, exercise capacity and physical activity in children: are we measuring the right thing?